The death of a loved one is often one of the most painful experiences we go through. When someone dies we often feel at a loss to express our emotions and heart felt feelings. At the same time death often brings our deep-seated fear of death to the fore. More than any other medium, poetry seems the perfect expression of both our own sentiments and a fitting tribute to those who we have lost. Also the profound sentiments of the great Seer Poets can be of comfort and reassurance that death is not the extinction of life. In grief at the death of those who are close we should not forget the positive qualities of those who are no longer in the world. On a person’s death we instinctively remember their good qualities and contributions. To remember the good in others is the strongest counter point to grief. This poem helps us to remember the real essence of a person. There is no necessity for funerals to be just solemn occasions devoid of smiling and laughter. Humour is an essential part of life, so why not of death. To many Death creates uncertainty and fear. It seems we shall never meet again. 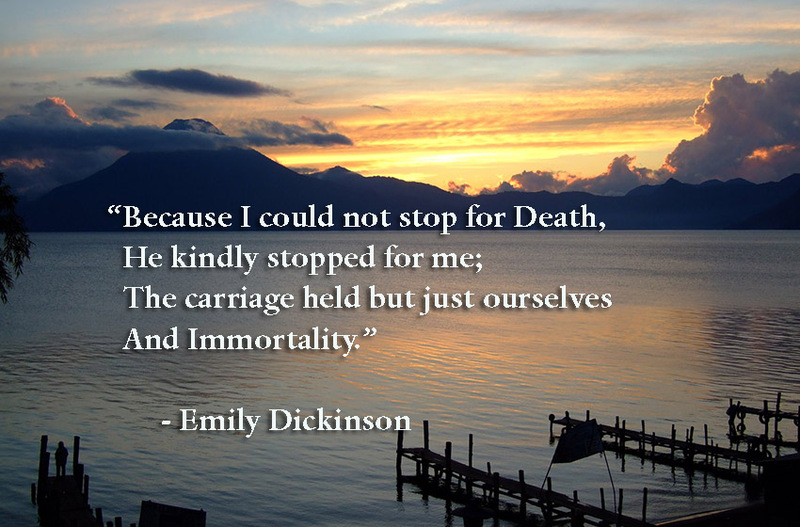 But the poets remind us of the essential truths of life, death and immortality. If death is a chapter in a book, like moving from one room to the next. There is no reason for the passing of a loved one to result in endless pain and grief. Poets inspire us to look on the bright side of life. “The existence of ours is as transient as autumn clouds”.